Every month I will update an entry about everything that I bought for that month. Always wanted to share with you what I bought so if its good product/things, maybe you can give a try? Why not, right? So, without any further, let's jump to the haul!!! I planned to do RM100 makeup challenge for you guys after watching Shila Amzah video. I'm so impressed cause she can do a makeup look using RM100 only! How cool is that? But unfortunately, I can't do like that because I didn't have so much time to go shopping for my makeup at that time, so I just grab what I want. 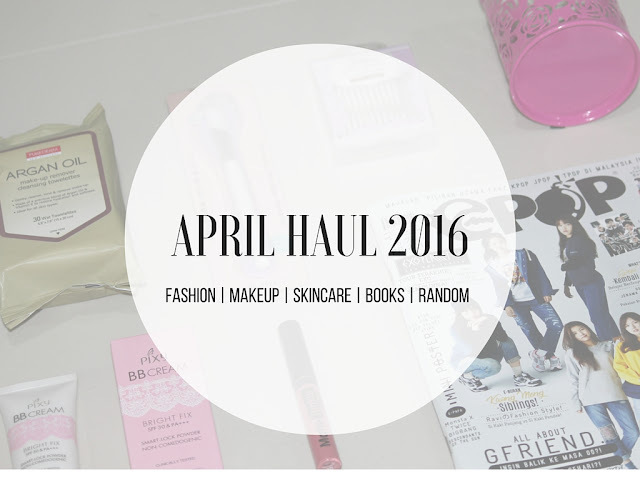 RM100 Makeup Challenge changed to April Haul 2016. But if I have time to look up for makeup I will definitely be doing that. Promise! At first, I just pick this magazine up just to see what inside but I was a bit excited when I saw Gfriend on the front page. On that time, I said "I need to grab this! It is Gfriend, okay?" Without waiting so long, I grabbed one for myself. Actually few years back, I tend to buy Epop every single month, but then I stopped. So buying these magazines reminds me when I was with my best friends talking about Kpop and everything during my secondary school. This April issue also included stories about Lee Kwang Soo in Malaysia for Samsung S7 and also Kwang Mong Siblings which are Kwang Soo and Song Ji Hyo in Runningman. Before this, I did use a makeup wipe remover from the brand Watsons but I can't find it anywhere at the store anymore, maybe it just out of stock. But, they just have wet tissues. So, since I ran out of makeup wipes, I just take a makeup wipes that I see during my time on Watsons. What attracted me to buy is because of the argan oil. You know that argan oil has a lot of benefit right? I'm so excited to try since this is my first time using this brand and using argan oil wipes to remove my makeup. I will definitely be doing a review about this makeup wipes for you guys so you can know whether it works or not. Wait for it, okay? OMG, I have been wanted to have lip cream for a long time. The major reason is because I didn't like to re-apply my lip colour every single time so I think that lip cream will help me through this. I think Silky Girl just release a new product line which is lip cream cause I never see lip cream product at the drugstores before. Or, I missed it? Since Silky Girl have promotion in Guardians during that time, why not to grab one, right? I'm having a hard time choosing the shades that I want. I really really wanted to have a red lip colour but since that lip cream has variety color selections make me take a few time to think which colour should I pick. Lastly, after I did swatch on the back of my hand, I picked up code number 2 and left my dream to have a red lip colour behind and buy my usual lip colour instead, which is pink. I think I do prefer BB Cream rather than foundation. Not to mention because it is a bit pricey but BB Cream is more convenience. Even though the coverage is not super high but for me it still some of my blemishes, scars peeking through on my face. But, using BB Cream doesn't make my face look too cakey in fact its make the face looks more natural like actual skin. Adding that to my skin just to give seri to my face. Since I heard Pixy just launched a new BB Cream, why not to give it a try, right? It cost me about RM 18 only, how affordable is that. There also provided a few shades so that you can matches it to your skin. Oh ya, I picked up Beige, the lightest shade if I'm not mistaken. Having one side uneven eye makes my eyes look a bit weird. Not to mention my hooded eyes too. So using eyelid tape really helps me solve my problem. I usually using this eyelid tape when I want to go out or wear it just for fun. I think if I use it regularly my problem regarding my uneven eye will be gone. But the downside about using this kind of product is I can't put any eyeshadow to my eyes because the tape tends to cover all my lids. So every time I wear eyelids tape I usually didn't wear any eyeshadow at that time. And the good thing is, when I have even eyelids, my lashes look more pop and better than without eyelids tape. This tools really really useful cause I don't have to get my hands dirty anymore. I have one before but the brush doesn't in good shape anymore. This thing is perfect to use for a liquid mask like Egg White Mask, Shiseido, and more. It is also time-saving cause it is easy to use and wash too. Just put the brush in lukewarm water for a while and rinse it. The tools also included spatula so it will make it easier for you guys to mix and stir your mask before you use it. Very very useful! I think that's all for my April Haul 2016. I think I spent less money than my previous month. Which is great. Yay! If you want to know more about the products or you want me to do a review, just leave a comment down below. I'll try my best to answer them. Singgah membaca April Haul di sini..
5 Years of Blogging. How Do I Feel?